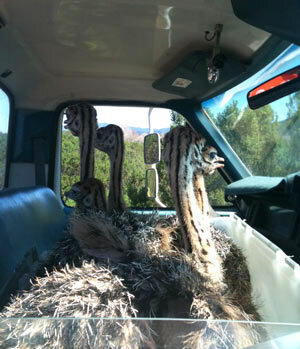 Visit us at Ostrich Land! Join us! Whether it’s a once-in-a-lifetime Central Coast vacation stop or a return visit to see old friends, a trip to OstrichLand USA is unforgettable. 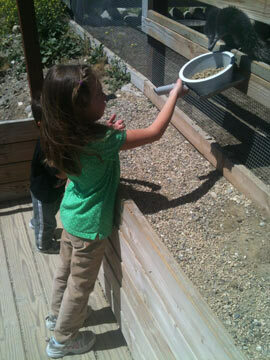 You’ll always remember the time you spent watching, feeding and getting to know our amazing ostriches and emus. We can’t wait to see you at OstrichLand USA in beautiful Buellton, California. We promise to do all we can to make your visit an experience you’ll talk about for years to come. OstrichLand USA is a great place for family fun, photography, field trips, and bus tours. Groups are welcome and guided tours are available. Please note: We require advance notice for groups of 15 or more. Call (805) 686-9696 to let us know you’re coming. This allows us to provide the best experience for your group and other guests. Be sure to pick up some fun things in our gift shop while you’re here. Imagine the omelet you can serve made from fresh emu or ostrich eggs! Make dusting fun with an ostrich feather duster. Share some ostrich jerky with friends. Or wear your OstrichLand USA hat or tee as a great conversation starter. Ostrich feed is available for $1 per bowl*. *On most days, the birds can be fed throughout the day, but on busier days we may limit the available feeding times to ensure the birds are not overfed. 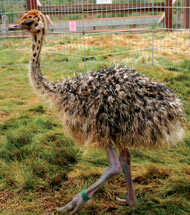 Ostrichland USA sells a large variety of ostrich and emu related products. reach 8 or 9 feet tall!